DISCUSSION: Digital Kids and Screenagers: How Do We Teach Them? Whether an addiction or a preoccupation, learners of every age are wired. Further, much of a typical school-aged learner's day is spent texting, surfing the Internet, scrolling through an ipod, playing electronic games, or staring at the television or a computer screen. What tools and approaches can (do) art educators use to effectively teach and reach digital learners? Wanje Mode: How many are currently teaching? SageStage Minotaur: what was the focus of your web workshop? SageStage Minotaur: sounds very interesting Zultress/Sherry. Was it for art teachers? Will you be writing about your teaching so we can learn from you? Wanje Mode: In what other contexts are others teaching? Ootah Quartz: I'm interested in visiting scholars through Skype. Interested? Zultress Maven: I think using skype for visiting scholars is a really good idea have you done it already? Ootah Quartz: yes. I do it every semester for years. SageStage Minotaur: I will do a search Sherry to find your work. I too use skype to bring in scholars and artists. Read Diket presented in my research course last semester. Ootah if my work is of interest please feel free to include me in your secondary methods course via skype. Wanje Mode: This is one. what other ways have technology change how we teach? Or how have our roles changed as art educators due to technology? 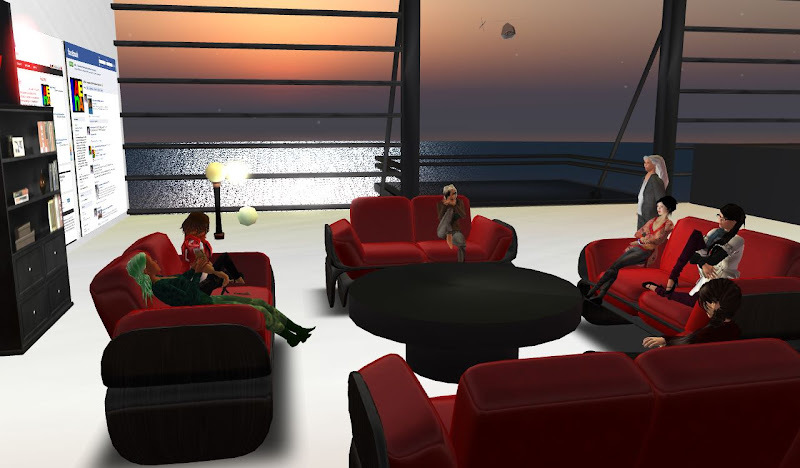 Zultress Maven: How the role of art educators have (or if it has ) changed due to technology? Wanje Mode: Today's topic relates to how we can best teach digital kids and screenagers. Wanje Mode: How can we use technology to encourage self-motivated learning? SageStage Minotaur: Technology has been changing how I teach since the 1980s. I taught filmmaking and animation with 16mm, then analogue video stop motion, now with digital cameras and editing, including machinima. This is just one thread of changes. SageStage Minotaur: In another thread, I have used technology for community-based art education in which the curriculum connects and derives from community involvement. Therefore, the flexibility of curriculum shared and developed collaboratively has changed from print-based, snail mailed communication to digital documents that better facilitate change, to the Web 2.0 participatory architectures. Lilly Bieler: We need to facilitate student meaningful learning about art through different digital tech including digital art /new media art and their situated digitial visual culture for example. Wanje Mode: Is technology the means to a particular end? Or are we concerned about teaching students technical skills? SageStage Minotaur: Technology can be a pencil, and all technology are cultural interfaces. 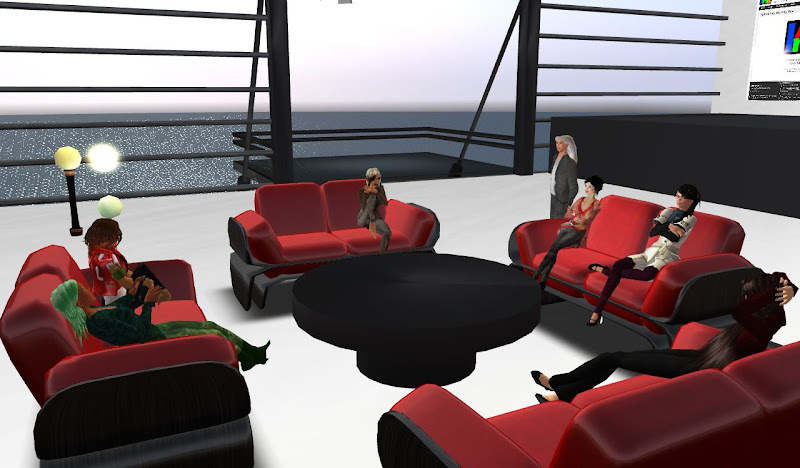 Ootah Quartz: I do think students THINK differently through technology, but I worry about those without access. Zultress Maven: I agree that there is no set tech skill set and that they may be more savy on certain technologies than their post-modern teachers, however, the design of problems to solve is where I think the craft of teaching lies -- anyone else have thought on this? SageStage Minotaur: Artists used social networks and the Net as medium. I continue to introduce contemporary artists and artworks in my teaching, and the integration of social networks and Net as medium are explored by students in my classes. SageStage Minotaur: I teach students to teach themselves how to try, evaluate for potential and limitations, select, and then use mediums--including computer applications. I encourage use of free or open source. Wanje Mode: How about informal, interdisciplinary, and multimodal methods of using technology? Lilly Bieler: From my teaching experience, I think that building a postivie attitude toward using new digitl tech is the key. After they learn the principles and develop a good habit, they can self-learn and adapt them to any new technology and content. SageStage Minotaur: Interdisciplinary inquiry is necessary to solve complex problems. Contemporary art is a prime example of how artists are currently drawing upon diverse knowledge systems in novel and critical ways. By using the processes and practices of contemporary artists, visual art education introduces and provides practice in interdisciplinary thinking and inquiry. SageStage Minotaur: Yes, I believe that embodied learning is important pedagogically in working with and understanding the cultural interface of technologies. Wanje Mode: Do you find that students are self-motivated or motivated by the grades? SageStage Minotaur: I envision a future techno-infused eco-pedagogy in which knowledge, disciplines, and courses are not organized by discrete timeframes, and students are not grouped by age but rather by investigation of topics. Moreover, alphanumeric grades become obsolete and instead evaluation, based on criteria set by the student in dialogue with others in areas of student interest, is presented to global teams of mentors via electronic multimedia portfolios that reflect student learning and thinking. SageStage Minotaur: So, no I do not find grades helpful to self-motivation. It is extrinsic motivation. SageStage Minotaur: Exactly, that is why grades hinder life long self-motivated learning. Wanje Mode: While I do want students to be self-motivated, oftentimes they are more concerned about the grade than the learning. Liliann Ling: I agree. I think part of the reason is the environment they grow up. SageStage Minotaur: It is the stuff young people do NOT for grades, that they spend enormous time doing that is their substantive learning. SageStage Minotaur: However, many of us work in institutions that institutionalize grading. Wanje Mode: This is true. So, let's turn our attention to social networking. What practices do (can) art educators use to capitalize on students liking for social networking? Zultress Maven: Do you require weekly postings Liliann? Liliann Ling: no. but I ask them to respond to others. If not as part of grading, they won't do it. SageStage Minotaur: While not a perfect work around, having students develop the rubrics/assessment as a way to know if they understand, for example, Net art has helped them to feel self-motivated and invested in their work, When students develop the rubrics/assessent of their work in the process of learning about something, for example, Net art, there is more likelihood of self-motivation because of the investment in how they will evaluate their work. SageStage Minotaur: google doc has worked okay for collaborative script writing as long as it is not too many working on it. As part of the 2010 Imagine Festival, UTSA is presenting SnowCrash. This newest exhibit at UTSA"s ArtSpace is a scene of Neal Stephenson's 1992 novel "Snow Crash." The entire sim was developed by Igor Ballyhoo in collaboration with Rebeca Bashly, both of whom worked tirelessly for weeks to create an immersive environment that captures the mood and scenery of Stephenson's novel. This work alone makes a visit to the exhibit more than worthwhile. 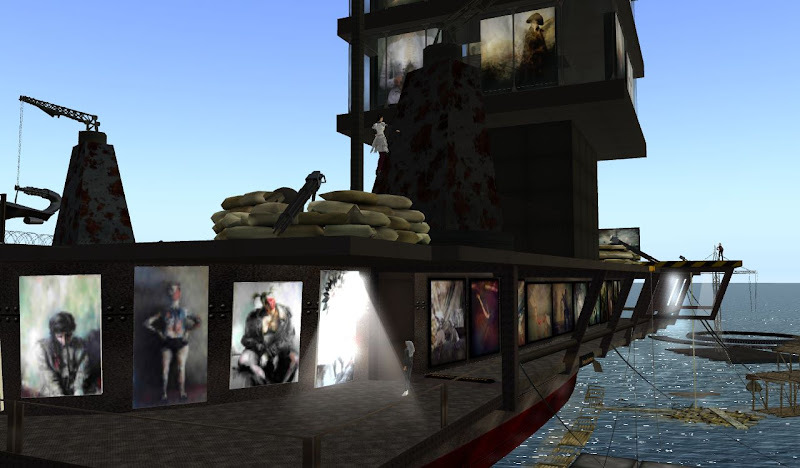 What further adds to the experience is the fantastic art placed by some of the most prominent artists in SL. 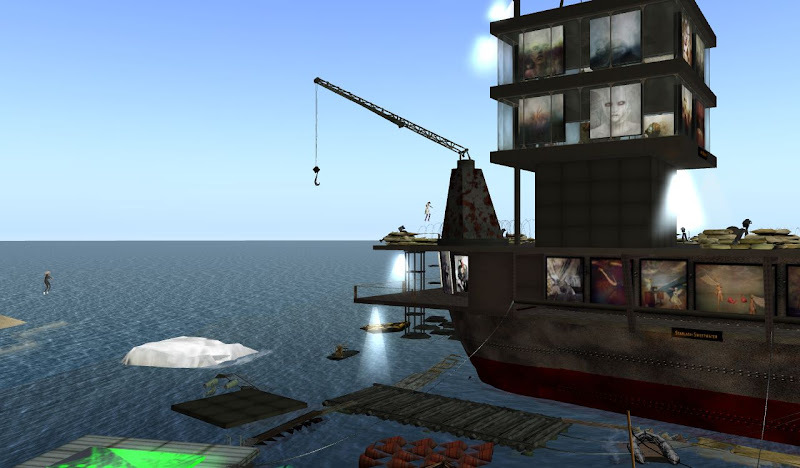 The exhibit includes 3D and 2D art set on boats and rafts around a central ship, as well as art placed on the ship itself.